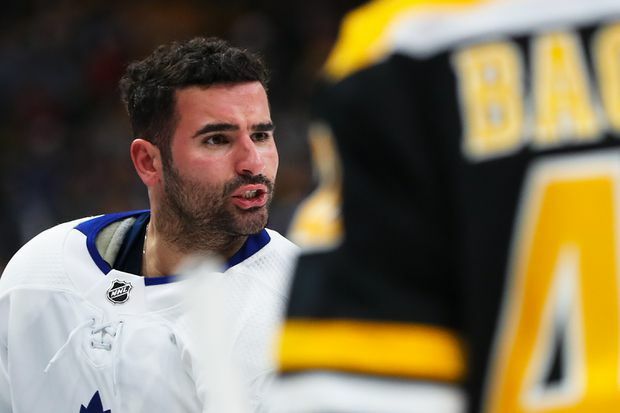 Nazem Kadri reacts after a fight with Jake DeBrusk of the Boston Bruins in Game Two of the Eastern Conference First Round during the 2019 NHL Stanley Cup Playoffs at TD Garden on April 13, 2019 in Boston, Massachusetts. The Toronto Maple Leafs’ Nazem Kadri is suspended for the rest of the first round of the playoffs for his vicious cross-check to the head of the Boston Bruins’ Jake DeBrusk. The Leafs were beaten by the Bruins in Game 2 of the best-of-seven series, when Kadri made his hit. With the Bruins and Leafs playing Game 3 on Monday night, the suspension could run between three and five games. But the suspension might have been worse given the Leafs centre’s track record as a serial offender. The NHL’s player-safety department possibly could have suspended Kadri, 28, for the rest of the playoffs and even into next season. It was just a year ago that he was suspended for three games, also in the first round of the playoffs against the Bruins, for slamming Tommy Wingels headfirst into the boards. In a video explaining the decision, an NHL spokesman said there was nothing accidental about the hit, which came just after DeBrusk slammed Leafs winger Patrick Marleau into the boards. There was already bad blood between Kadri and DeBrusk after the pair had a knee-on-knee collision earlier in the game for which the referees did not assess a penalty on DeBrusk. This was the fifth suspension for Kadri in nine years in the NHL. The cross-check on DeBrusk was the second time he was suspended for driving his stick into a player’s head. “Not only is Kadri considered a repeat offender under the [collective agreement], having been suspended for three playoffs games almost exactly one year ago, but Kadri has also previously been suspended for a similar retaliatory cross-check to a player’s head, Detroit’s Luke Glendening,” the NHL noted.